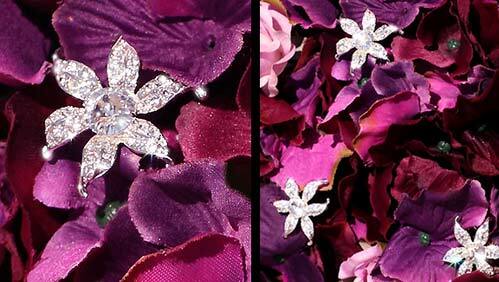 Gorgeous 6 petal rhinestone flower bouquet accents come in a set of 3. Each flower is 1 1/4" wide and attached to a 10" long silverplate stem to securely attach to your bridal bouquet or flower arrangement. The silverplate stem can be bent to accommodate all sizes of bouquets.